Let’s rewind to the end of 2014. I was 27 and working full time for a major health insurance carrier and running a clothing line. So I would say that I was rather busy with work and in free time going out and enjoying life. It was October of 2014 that my boyfriend suggested that we join a gym and work on a healthy fit life to take up some of our free time. I was really hesitant, because although I had grown up playing sports, cheering and on the track team; I had never really worked out on my own. Yes, I would go for a random run every now and then. However the thought of being a “gym goer” and being stringent about going to the gym a few times a week, just didn’t sound appealing. Nor did I feel I had the interest and self dedication. None the less, I was open to the thought and figured, it can’t hurt to add regular fitness into my lifestyle. After all, I am only getting older and need to adopt a healthier lifestyle. I wasn’t fit and my diet wasn’t great either. I was probably what you would call ‘skinny fat’, and not particularly healthy, so don’t worry if you are in the shoes I was in at the time. It is never too late to start. I began going to the gym a 2-3 times a week starting in January 2015 and continued to do so throughout the year. I would say that 2015 was a gentle ease into a lifestyle of routine fitness. In 2016, I had decided that I really wanted to put more effort into my workouts and focus on toning and losing about 10 lbs. As I was getting older, eating just about what I wished and however much of it I wante; my metabolism had begun to slow. I had hit 132 lbs and that had (at that time) been my highest lifetime weight. So, in January 2016, I really dedicated myself to working out 3-5 times per week (an average of 4 times a week) and began to lose the weight by incorporating cardio and weight lifting. By May of 2016, I had lost 15 lbs, enhanced the 4 pack I had previously had and felt a lot stronger. I was happy with my results at 117 lbs, felt great in my body and was healthy. Long behold, in June 2016 I found out I was pregnant and due March 1, 2017. I continued to workout with lighter weights and regular running through my 7th month of pregnancy. In the first trimester, I had only gained 2 lbs, and thought, “Okay, this is going well”. In the 2nd trimester I gained another 13 lbs and a whopping 26 lbs in the 3rd trimester. However, mind you, I had never restricted my diet when I was pregnant. I ate whatever I wanted and usually a lot of it. None the less, the weight really packed on that last trimester and after baby I was stuck with 41 lbs to lose in order to get back to my pre-pregnancy weight. Our little boy was born one day past his due date. I had labored for 17 hours and the delivery (although not how I imagined it nor wanted it, but will get into that in other posts) was okay. However, I ended up suffering a severe hemorrhage, which required an emergency surgery 9 hours after delivery. I of course needed to give myself adequate time to heal prior to jump starting my pre-pregnancy weight journey. One month after delivery, I had lost 20 lbs, which was most likely majority of the extra pregnancy blood and water retention. Month 2 after delivery, I had only dropped another 8 lbs. In month 3, I have finally begun to add in regular fitness a few times a weeks, aside from daily walking. I am officially on my journey to lose the last lingering 13 lbs. Join me on my fitness journey after baby for workout, health and overall fitness tips, share your stories and progress and as well, following my journey. Next Post Happy 30th birthday! Love your post. Looking forward to the tips and progress we can both make back to pre baby weight/. Looking forward to the tips. 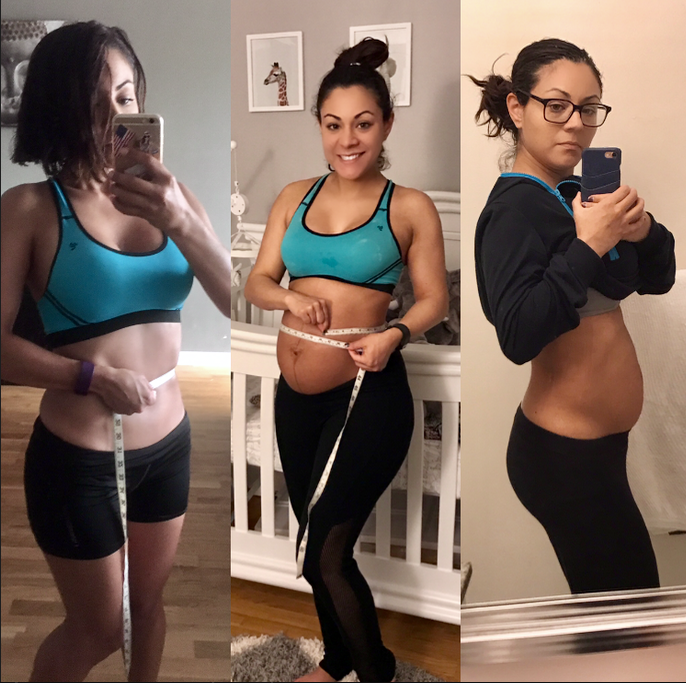 I had a c-section and have been trying to get back into the workout game but 7 months after baby still haven’t been able to do a lot that I was able to do before. Ready to join this journey with you. How many months postpartum are you now? Curious to see your current progress. You looked good one week out. I have a very similar story with working out. I just started about two years ago. You should create a fitness group for moms to hold each other accountable. I would join. I need some support. I am five months out and am having trouble working out after work. Thanks for the inspiration. I’d like to join you in your fitness regimen.